US companies deployed more robots last year than ever before – as advanced machines capable of specialized tasks have come down in price and availability, reports Reuters. 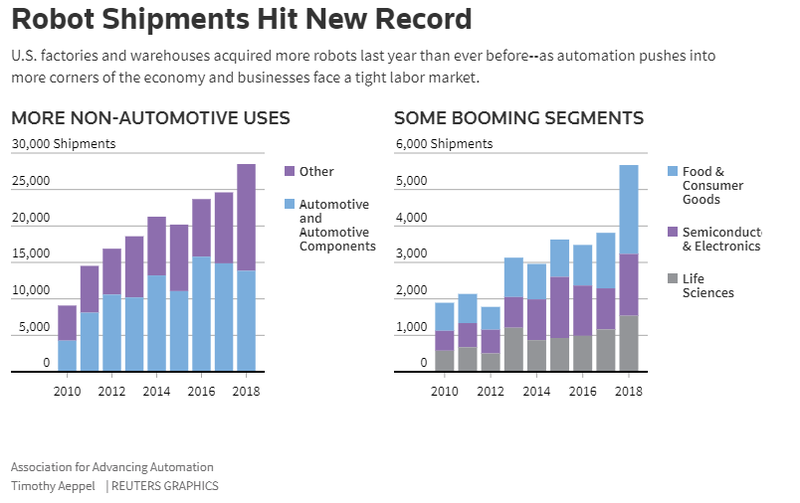 Shipments of robots hit 35,880 in 2018 – up 7% over 2017, according to the Association for Advancing Automation (A3) – an industry group based in Ann Arbor, Michigan. What’s interesting is that while most robots have historically been bought by the automotive industry, 16,702 shipments went to non-automotive companies, an increase of 41%, while automotive industry orders dipped by 12%.